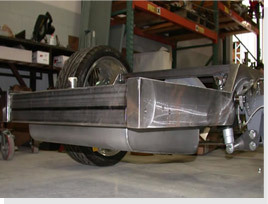 Looking to move that gas tank out of your cab and in between the rear frame rails of your classic Ford or GM truck? Quality Stainless Steel Fuel Tanks by Rick’s are U.S. made and a great way to go! And, you can get them for EFI fuel systems or carburetor. Fuel injection upgrade available for all tanks using AC Delco pumps. 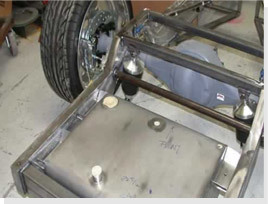 Photos of a Rick’s tank inside the frame rails of a new TCI ’56 FORD chassis.